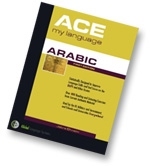 This is the first edition of Ace My Language: Arabic, the only mobile app to prepare military, government and college language students for their DLPT V in Modern Standard Arabic. The DLPT is a crucial test that measures the language knowledge of people who want to work in the US government with a focus on the Arabic-speaking Middle East. The app prepares students for the test and for their jobs. Guaranteed to increase your score on the exam. Includes up to 406 articles from authentic Arabic sources and corresponding native audio for each passage. This app is used at West Point, The Defense Language Institute, Foreign Service Institute and other military language schools around the country. The ultimate resource you or your students will need to prepare for your job requirements as a translator, analyst or simply to prepare for standard Arabic language tests that examine your listening and reading skills. It is also a great resource for Arabic students in an academic environment or those studying Arabic independently to pass Arabic standard tests as administered by government agencies or academic institutions. Immerse yourself in Arabic like never before to get the results you want and improve your score. * Over 400 challenging passages, questions, and audio passages by a native speaker of Arabic simulating the actual DLPT format for real practice testing experience. * Live material from various open media sources covering all DLPT content objectives including economics, politics, science, technology, geography, culture, social, military, and security. * Comprehensive exposure to critical terminology and vocabulary, both familiar and unfamiliar, in various contexts, to increase your overall vocabulary and to improve your ability to infer and deduce meaning. * Material of varying levels of complexity, including Arabic and foreign names of people and places, to challenge your listening and reading comprehension. * Your first Arab friend, Abu Farid, chiming in on every page with fun cultural commentary including jokes, quotes, and sayings. "The comprehensive Arabic language tutorial package developed by Jabra F. Ghneim has proven to be an invaluable tool for students of Modern Standard Arabic (MSA). His work, which involves a vast amount of critical listening and reading question and answer exercises, has proven to be vital to the student that is required to grasp a wide range of global language knowledge. Mr. Ghneim has developed a masterful project that keenly recognizes the necessities for basic and expert understanding of MSA. The material is interwoven from subject to subject which enables the student to quickly transcend all subject matter barriers of learning a foreign language." "Jabra Ghneim is an excellent language instructor. His excellent command of both Arabic and English coupled with highly effective teaching methods ensures improved results. Under his instruction I was able to raise my scores to their highest levels in 15 years. I would highly recommend his materials and intend to make them a part of my test preparation routine." "I'm impressed with it (the book) and I do recommend it - based soley on having perused the reading portion (I haven't checked out the listening portion yet but the reading portion alone is great for what the book is intended to do). It is not a "learn Arabic" book. It's an improvement tool for folks who already have some Arabic. It is very well focused specifically on improving DLPT performance. I think the folks who could most benefit from this are those at the 1+ to 2 level who are serious about spending some time and effort getting to 3. This book will help them focus their effort and get the most DLPT improvement out of the time they invest. Casting a wide net in newspapers and internet and reading widely is another approach. But in this book Mr. Ghneim has already cast that wide net for you and collected the material in an easy to use format - plus taken the extra step of constructing DLPT-like questions about the material. He is clearly familiar not only with the kinds of materials that go into a DLPT, but also with the kinds of questions that are constructed around those materials."